To cross the border and to meet a neighbor country citizen is always a difficult task when it comes between Pakistan and India; but young students of two countries are paving the way of a peaceful future and exploring the similarities and differences, learning from each other, talking, laughing, enjoying with each other and exploring bond of friendships through classroom connect programs. ICT (Information, communication, technology) is the tool of connection and video conferencing is helping them to enable and to create their peaceful future through breaking stereotypes. 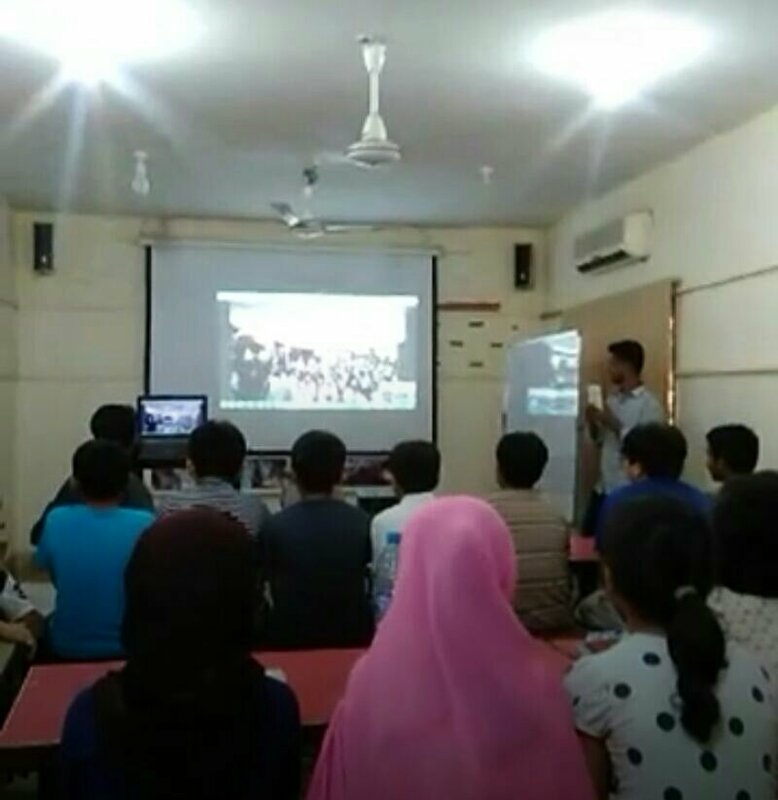 When Aaghaz-e-dosti Surat chapter’s coordinator Sagar Papneja in India and Amman Pukar’s President Asifa Sheikh in Lahore, Pakistan informed their students a day before about the scheduled classroom connect program where students would get an opportunity to talk with their peers on other side, students became very enthusiastic to participate in the session. Though their initial idea about the other side was much built through the secondary sources of media and what people say, they all were much excited to talk and they never had done this before. The idea was to let students from both nations learn about culture of each other in order to promote peace and it was organised in spirit of World Cultural Day. This was 15th classroom connect program of Aaghaz-e-Dosti and around 40 students from both sides took part. ​The session began with students from Amman kids club Lahore gathered in Gulberg singing a song about friendship ‘Dosti aisa naata’ for their peers across border to which Indian students presented a famous bollywood song “ye dosti hum nahi todenge” (We will not break this friendship). Safina from Lahore recited a beautiful poem and Atishi from Surat narrated a story. Students explored their subject leanings and fear as well and one Pakistani student told that she loves Maths to which Indian student expressed she was fond of English. Students Tanya, Vihaan & Keshav from Indian side spoke about their culture, festivals and traditions and Pakistani side students Urooj, Komal and Mehreen also spoke about diverse culture, festivals, traditional attires and languages of Pakistan. They talked about Ramzan, Holi, Eid, Diwali and Basant festivals. Himakshi from India recited “Aag jalni chahiye” a famous couplet of Dushyant Kumar. Guitar was played by Kapish to which students sang “Gulaabi Aankhein Jo Teri Dekhin” and it made the whole environment filled with much fun. 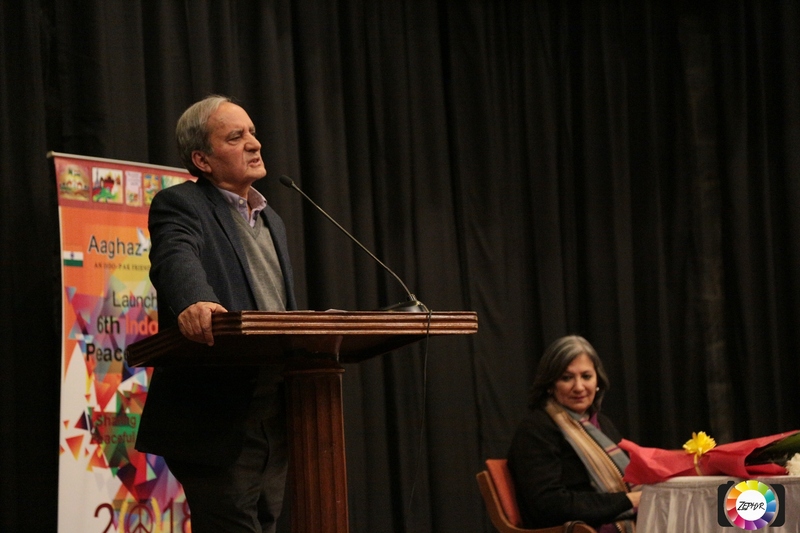 The atmosphere was mesmerized when Mohsin Hashmi, one of the directors of Amman Pukar, recited a poem named “sweetheart” for students on Indian side. This was followed by Sahil from Indian side reciting his beautiful poem titled “Hamara desh ek classroom” and Sofia from Lahore singing a song in her melodious voice. During the connect program coordinators also explored their ancestry and found that while Indian coordinator Sagar’s forefathers lived in Layalpur (Faislabad) before partition, coincidentally Asifa’s grandparents belonged from Amritsar and Jalandhar. Another inspiring moment came when Mehreen from Pakistan mentioned about Akbar and Sheeshmehel in their town as Indian students had read about Akbar in history and they knew about the Indian Sheeshmehel. After this, students were given time to directly interact with each other where they talked much about cricket, Bollywood, TV serials etc. Sahil (India) asked if the students from Pakistan also break glasses while playing street cricket and was glad with the affirmative answer and was introduced to Murtaza who had done it a lot of times. Karan (India) enquired about the street cricket rules and asked if they also have one tip one hand out. Sunny (Pakistan) replied that they also have similar crazy rules and questioned back to Indian students if they fly huge colored *Guddis*. All the Indian students together jumped on it if guddi means Patang (Kite) and then they all cheered and explained about Makar Sakranti and Kite flying festival. They then invited each other for the same. Rashmi asked them about their favorite actor and Komal replied with Mohseen Khan (he acts in Indian serials) and asked Indian students about their favourite actor to which Shilpa replied Fawad Khan. There were many such questions asked and answered. After these conversations, Kapish presented vote of thanks and appreciated the energy and time by Pakistani students despite fasting for Ramzan. Both the sides waved good bye with a promise to talk again. Coordinators and students on both sides expressed that this was a beautiful event to witness. An hour filled with emotions and cultural exchange to learn about each other, the similarities and the differences. Volunteers were overwhelmed as they got messages from students and their parents thanking for doing this and making it possible for students to experience something which they never had done before. 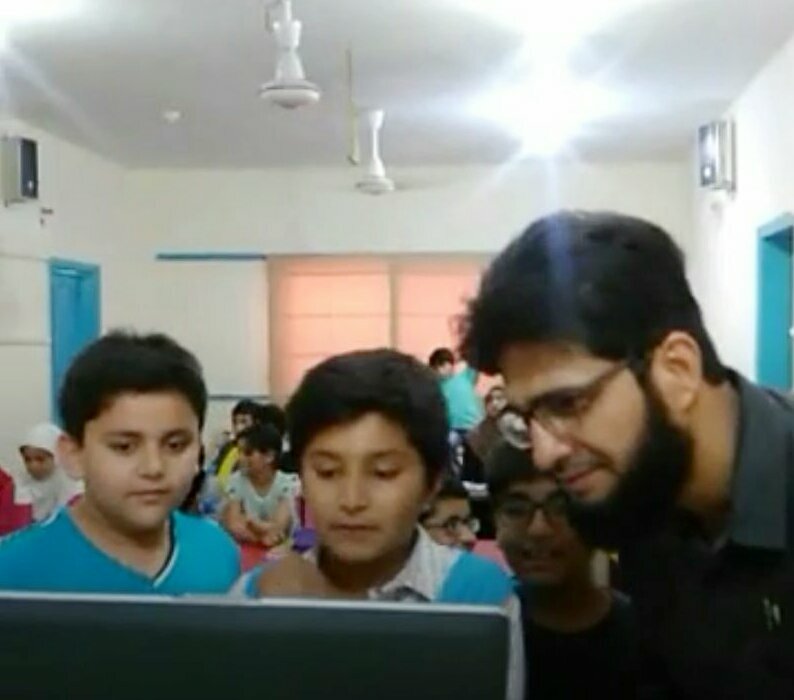 Aaghaz-e-Dosti conducts such classroom connect sessions to connect school students of Pakistan and India. This was 15th such session. For Amman Pukar, this was first such session. Asifa, President of Amman Pukar , Lahore expressed that though Amman Pukar works for promotion of peace on local level in Pakistan, this was first such session where they realized the potential efforts of peace through such video conferencing sessions. Sagar who was coordinator of Aaghaz-e-Dosti from Indian side told that considering both countries have young population, such sessions would definitely help young minds in exploring more about peace as with these sessions, students build their own opinions which are free from media bias. 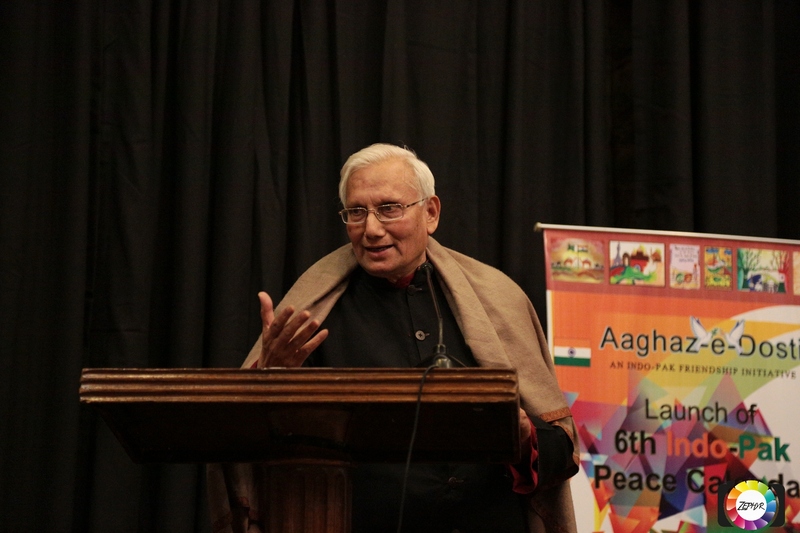 Founder of Aaghaz-e-Dosti, Ravi Nitesh said that we are conducting more such sessions in coming time and we are hopeful that future belongs to these young students who are advocating peace. There are few things that cannot be restricted by any borders, these are emotions, dreams and hopes. We, at Aaghaz-e-Dosti, have always believed in promoting these free birds for spreading peace. We join hands with Kavishala to give you an opportunity to weave them in a beautiful poetry and we will help the peace bird take a greater flight. Language – English, Hindi, Urdu, Punjabi or Sindhi (For punjabi and sindhi, please send a rough translation in Hindi/Urdu or English). 20 poems from each of the 4 languages will be selected. Surat/Karachi: Amid the turbulent political relations between the two countries, people on both sides still looked for ways to build bridges to remove enmity and to break stereotypes as a process of peacebuilding. 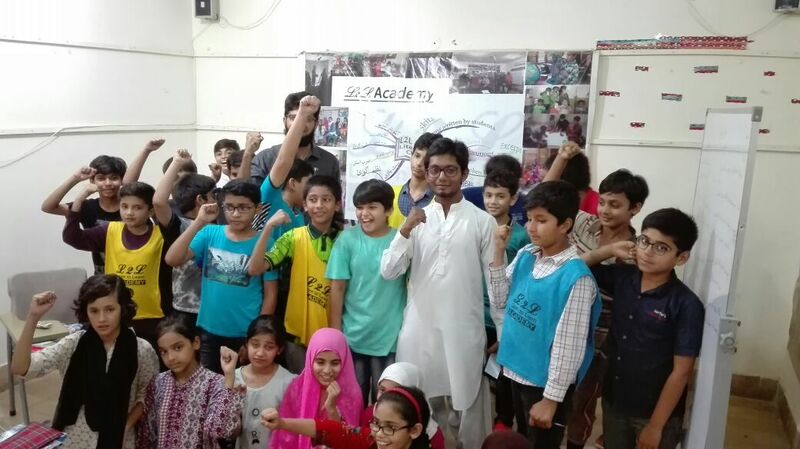 In its line of peacebuilding through programs of peace education in schools across Pakistan and India, Aaghaz-e-Dosti organised its 14th “Classroom to Classroom connect” program between students of Karachi city of Pakistan and Surat city of India on 5th May 2018. This classroom connect program was conducted in collaboration with Akhil Hind Mahila Parishad, Bruhad Surat branch from the Indian side and L2L (Learn to Learn), a Karachi-based commercial alternative school from Pakistan side. This classroom connection program connected around 150 students. On the Indian side, students were participants of summer camp in the centre while in Pakistan, students were participants of an activity learning school. The session was coordinated by Sagar Papneja of Aaghaz-e-Dosti Surat Chapter and Adnan Kudiya, a Karachi-based educator and activist working with #MainBolunGa, a social cause from Pakistan. 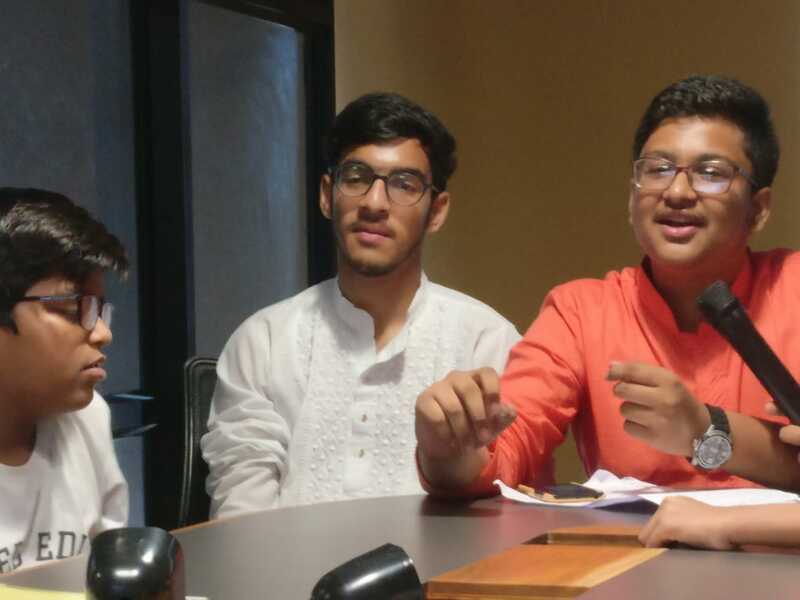 Before the connection was initiated, students on the Indian side were asked for their opinion about the neighbor country and they voiced some of the stereotypes and misconceptions. When asked for the source of their knowledge, they said parents, movies, and news. The coordinators gave them an analogy that they choose their own best friends and that their parents never tell them whom to befriend so then why shouldn’t they apply it here, in this case? They should choose their own friends and even foes by analyzing, talking to them and then deciding. They agreed. The session began with national anthems of both the nations. It was followed by a discussion on summer vacations. The s tudents interacted for an hour and asked questions about favorite food, movie actors, songs, school vacations, and much more only to realize that on both the sides everything was same. During the session, students of both sides revealed their likes and dislikes and found that both sides loved many things similar. An Indian student asked to Pakistani students ‘Who is your favorite hero?’. Pakistani students replied ‘Fawad Khan, Hrithik Roshan, Tiger Shroff, Salman Khan’. Then Indian student wondered ‘Fawad Khan! Tiger Shroff! they all are our favorites as w ell’. Another Indian student named Jhanvi asked ‘Karachi me kya famous hai?’ for which she got reply from a Pakistani student ‘Karachi ko city of lights kehte hain’ to which all Indian students became happy and eager to know more. Then both sides together found that they both love faluda dessert, Afridi, Dhoni and Virat so much. In the lighter mode, both sides of students expressed how they hate school uniforms. In a surprise move, when Pakistani sides of students got to know about the birthday of a student on Indian side, they wished and sang a birthday song for the Indian student that made the whole environment very emotional. During the concluding time of the session, students of both sides requested to extend the session for more time and also sang “swag se karenge sabka swagat” and “bahubali” song for each other. By the end of the session, the kids befriended each other and realized that across border the culture is same. They were no-more enemies rather friends with some positive future ahead. Their glowing faces with this first ever experience were expressing their happiness after meeting their peers. 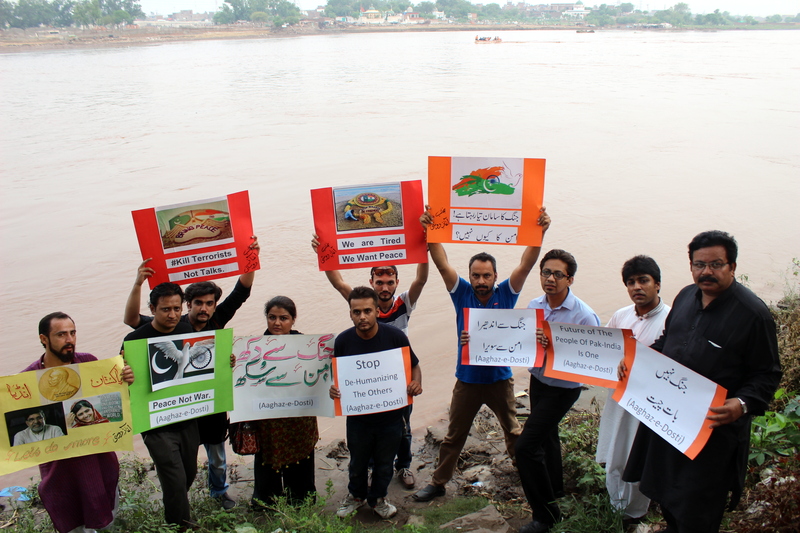 Aaghaz-e-Dosti, a collaborative peace initiative of two voluntary organisations – Mission Bhartiyam (India) & Hum Sab Aik Hain (Pakistan), believes that students are future of these countries and have all the potential to build new bridges of peace and reconciliation that would pave the way for future. New Delhi: Amid disappearance of its Convener in Pakistan since Dec 2, Aaghaz-e-Dosti continued its efforts on peace building and launched the 6th Indo-Pak Peace Calendar. Members of this young team are highly hopeful that Raza will return soon. Members informed that as a peace education group, our activities are not against anyone and therefore we think that we must keep working for our activities. 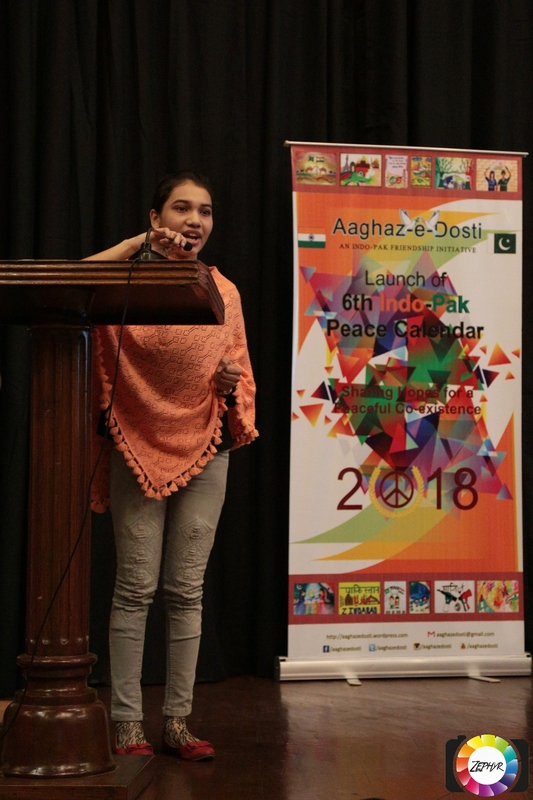 Indo-Pak Peace Calendar was launched in India International Centre, New Delhi on 13th January by voluntary youth initiative Aaghaz-e-Dosti that works on fostering people to people relations between India and Pakistan. This calendar is a collection of selected paintings of Pakistani and Indian school students along with messages from 12 renowned persons from both countries who favor Indo-Pak Peace. This year, peace calendar carries messages of Prof M S Swaminathan (Father of Green Revolution), Kamla Bhasin (Feminist and Peace Activist), Kapil Kak (Retd Air Vice Marshal), Rahul Jalali (Former President-Press Club of India), Nirupama Subramanian (Sr. Journalist and has been posted in Pakistan for few years) and Amardeep Singh (Author-Lost Heritage-Sikh Legacy in Pakistan) from India and of Dr. Mubarak Ali (Pakistani historian), Imtiaz Alam (Secretary General SAFMA), Anam Zakaria (Activist and author), Dr Anita M Weiss (Academician) and Farooq Tariq (Activist and spokesperson of Awami workers party) and Lt. Gen (retd) Mohd M. Alam. Aaghaz-e-Dosti aims to create unwavering bonds of peace and friendship between India and Pakistan and seeks to become the medium to discover and recognise the misrepresented reality on the other side of the border. It is focused on citizen diplomacy and works primarily through peace education aimed at familiarising the people about the ‘other‘, countering stereotypes, homogenised and negative image of the other, educating them about the issues of conflict, the existence of diverse views and developing critical thinking and developing confidence in dialogue and peace building for conflict resolution. This was the sixth year of the initiative and peace calendar. In earlier years, these calendars have been launched in several cities of India and Pakistan. 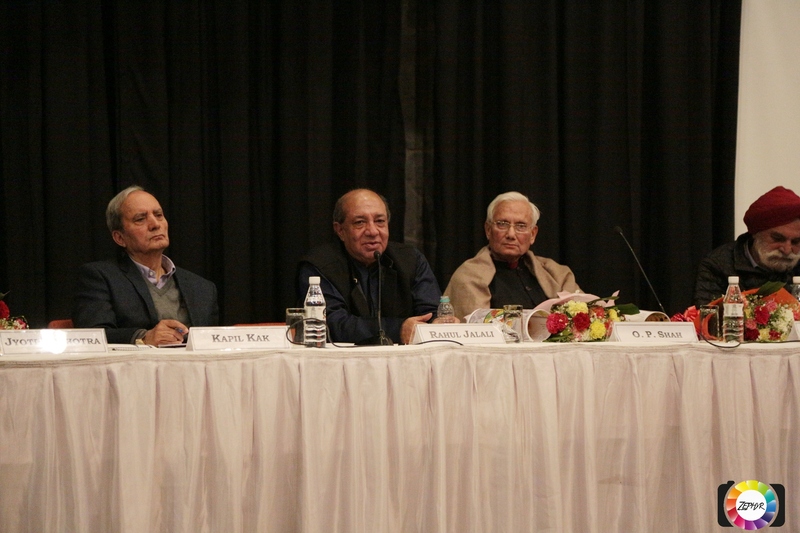 A panel discussion on the topic ‘Sharing of Hopes for a Peaceful Co-existence’ was also organised by India International Centre and Aaghaz-e-Dosti jointly where speakers like Kapil Kak, O P Shah, Rahul Jalali, Jyoti Malhotra and Prof Jagmohan Singh participated and spoke upon various issues. While speaking on the occasion, Retd Air Vice Marshal Kapil Kak talked about the importance of peace building, specially through such people’s initiative. He quoted Faiz Ahmad Faiz to explain diplomatic engagements between India and Pakistan- “Dil se toh har mamlaa hal karne chale, saamne aaye toh har baat badal gayi”. Highlighting the efforts of Vajpayee and Manmohan Singh governments, he called the 2003-2007 phase as the ‘golden period in the India Pakistan dialogue process’, post which he said we suffered from a ‘famine of dialogue’. Referring to Narendra Modi’s 2015 visit to Pak as a ‘leap of faith’ and quoted Elliot alongside- “only those who risk going far can know how far one can go”. He stated the importance of *connectivity*- need of engaging people across the LoC, media, public engagements for building opinions on the need for peace. He also told that we all need to have patience- most critical virtue, for any resolution as it takes time. Voices from both sides must speak for peace. Senior journalist and former President of Press Club of India, Rahul Jalali said that there are much need to work on peace building these days to counter hatred and violence at every level. He also insisted that media groups may play a positive role in peacebuilding effectively. He appreciated Aaghaz-e-Dosti’s for peace in today’s disturbed times when there’s a dearth of those taking on or for peace between the two neighbors. Highlighting the role of social media in shaping public opinion he told that need of the hour is to present facts and not focus on myth building and hate mongering. He advocated to continue dialogue as the world desires peace between the two neighbors. O.P. Shah who is founder of think tank Centre for Peace and Progress talked about the necessity of people coming forward and take a centre stage to decide policies of their own and demanding peace, harmony and development. Expressing hope for a much better things in future, he congratulated Aaghaz-e-Dosti peace building efforts. He talked of existence of ‘crisis of confidence’ between and among the neighbors. He also emphasized that unless well meaning people work hard together and with honesty to create a climate of trust and confidence, we won’t get much. He highlighted the importance of a continuous dialogue and he quoted Mani Shankar Iyer’s line- “there’s a need of uninterrupted and uninterruptible dialogue with Pakistan”. He also advocated the need of positive, constructive and meaningful role of media and need of leadership like that of Gandhi. Senior journalist and columnist Jyoti Malhotra emphasized that these paintings made by students are actually something we need to learn and understand about what these students, who are future generation of these countries, desire for. Lamenting the unnatural state of affairs between India-pakistan, she stated ‘it isn’t our responsibility to decide whether Pak is good or bad, what is needed instead is to hope for a more normalized relations with our neighbor, which given our geography cannot be ignored. She referred to Aaghaz-e-Dosti’s engagements with school children across the borders as the ‘story of the future’, wherein technology has to be leveraged in the interest of the two countries. Devika Mittal, Convener of Aaghaz-e-Dosti in India told that the importance of the calendar is that it is a collection of shared dreams and hopes for friendship which we will be reminded of every day. This calendar is one of our peace education activities in schools and colleges. The purpose of these activities is to enable the future leaders to forge the path to a better world by engaging them with aspects of critical thinking, civic engagement and dialogue as solution. She told that this year again Aaghaz-e-Dosti received many paintings from many schools of Pakistan and India. In these six years, Aaghaz-e-Dosti has been received paintings from school students from almost all states and provinces of India and Pakistan. Madhulika V Narsimhan, Aaghaz-e-Dosti member during her moderation talked about important points raised by speakers and also about various other activities of the initiative during last six years. Many eminent persons like educationist C. Raja Mohan, Supreme court advocate Ram Mohan Rai, Secretary General of South Asian Fraternity Satyapal, Activist Khurshid Reshi, NYP Coordinator Sanjay Rai, Youth activist Mushtaq ul Haq, Akhtar Hussain, Mubashir Malik, Suresh Yadav, Abhishek, Sanjana, Madhuri and others were present. Photography was done by Zephyr, a photography society of Delhi University students. Talking more about Aaghaz-e-Dosti, Ravi Nitesh informed that Aaghaz-e-Dosti has given peace trainings to more than 6000 students and youngsters through 20 Aman Chaupals (peace session) across India and Pakistan and also uses video conferencing to connect classrooms of India and Pakistan in sessions called Indo-Pak Classroom Connect that facilitates interaction between students of India and Pakistan. Aaghaz-e-Dosti conducts regular Exchange of letters and cards between students of India and Pakistan and has recently exhibited these letters at the renowned Faiz Ghar (house of Faiz Ahmed Faiz) in Lahore. Many students participated in the launch ceremony. They described and talked about their vision/thought guiding their art works. The teachers of the participating school also shared their experience. On the disappearance of its Pakistan’s convener Raza Khan, Aaghaz-e-Dosti stands on its earlier statement that the whereabouts of Raza are still unknown but all members are highly hopeful that Raza will be back soon and will start working again. Group has not criticized Government of Pakistan or its agencies and instead maintains that being a voluntary peace group, we respect constitution, democratic values of both countries and our activities are not against any government or ideology. Emphasising its stand, group states that it doesn’t attach itself with any ideology except ideology of peace and harmony that is need of this world. Aaghaz-e-Dosti is not a funded project of any organization and never receives any governmental or foreign support for its activities. Group states that their members are mostly engaged in peacebuilding through their participation in peace education activities among school students in India and Pakistan. 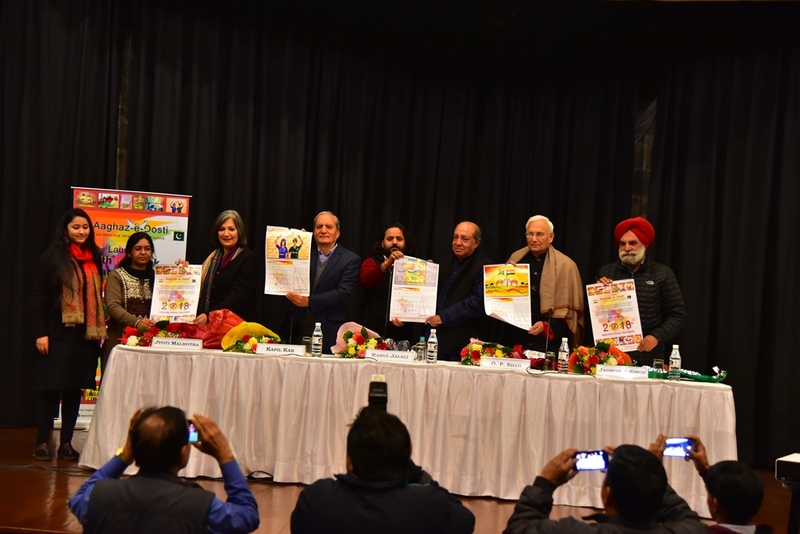 In previous years for its peace calendars, Aaghaz-e-Dosti received messages/ participation from Dr S N Subbarao, Kamla Bhasin, Dr Syeda Hameed, Col Virender Sahai , Major General Ashok K Mehta , Dr Shashi Tharoor , Vishwajyoti Ghosh, Pankaj Chaturvedi, Dr Dhananjay Tripathi, Ram Mohan Rai, Dr Meenakshi Chhabra, Dr D S Rana, Javed Naqvi, Deepak Malviya, Dr Chaman Lal, Late Sh Pankaj Singh, Air Vice Marshall (Retd) Kapil Kak, Sudheendra Kulkarni, Dr Kavita Sharma, Kuldip Nayar , Shailja Kejriwal , Tara Gandhi, Admiral Ramdas, Satyapal, Syed Salman Chishty, Ram Puniyani, Shirish Agarwal, Dr Pritam Rohilla, Pramod Sharma, Lalita Ramdas, Sadia Dehlvi, Manik Samajhdar, Deepak Malviya from India and Dr. Pervez Hoodhboy, Raza Rumi,Beena Sarwar, Sheema Kermani, Dr Ayesha Siddiqa, Aamir Nawaz, Rahil Yasin, Awais Sheikh, Dr. Salima Hashmi, Lt. Gen Muhammad Masood Alam, Dr I A Rehman, Khadim Hussain, Karamat Ali, B M Kutty, Anwar Jafri, Dr Ishtiaq Ahmad, Saeed Ahmed Rid, Nisar Ahmad Chaudhary, Dr Zahid Sahab Ahmed, Dr Farzana Bari, Asma jahangir, Dr Mubashir Hasan from Pakistan. The calendar is scheduled for launch in Pakistan on 27th January in Lahore. The 12th Indo-Pak Classroom Connect of Aaghaz-e-Dosti had connected students of Beaconhouse School System, Middle-I Gulshan branch, Karachi (Pakistan) and Gujarat Public School, Vadodara, Gujarat (India). The virtual interaction happened on the occasion of Global Dignity Day. Ms Amber Sajid, teacher co-ordinator from Beaconhouse School (Karachi) stated that they chose this event for Global Dignity Day as the day is about instilling love and respect for everyone, irrespective of any difference. It is the day which seeks to build consciousness about one’s identity as a human above all other identities. They wanted to use this day to bridge the gap between Indians and Pakistanis by dispelling stereotypes, making the students aware that Indians and Pakistanis have many similarities and to also learn to respect any difference which is there. It is important that students learn to respect and celebrate difference, diversity. The discussion was focused around culture. Since it was the week of Diwali, a major festival in India, students from Pakistan asked about it. They inquired about the story behind Diwali, it’s importance and how it is celebrated. Ms Abhilasha Agarwal, head of Gujarat Public School, shared that the students were very curious to know about Diwali. They wanted to know how do we greet each other on Diwali. The discussion as also around other Indian festivals, dance forms and customs. The students from Gujarat told them at length about the Gujarati culture and several other cultures of India. Some of the students had worn traditional attires representing the different cultures in India. They also showed them a plate with different types of snacks from India. Some students had also presented Garba and Mohini Attam dance form of India. A Pakistani student expressed her interest to know about rangoli which she had seen in Indian series. 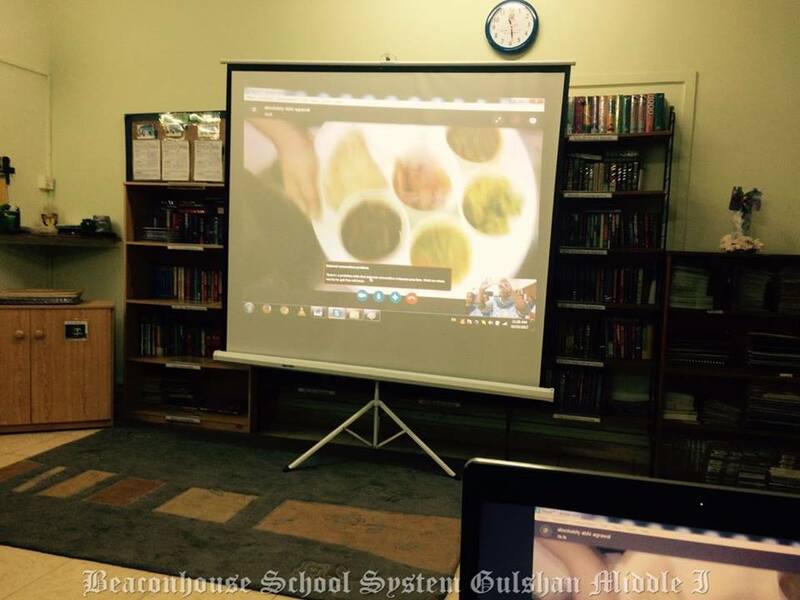 The Indian students, in turn, asked about Sindh, its food and culture. The schools plan to have several such sessions. They find these sessions helpful to inculcate pride in their their own culture as well as respect for other cultures. 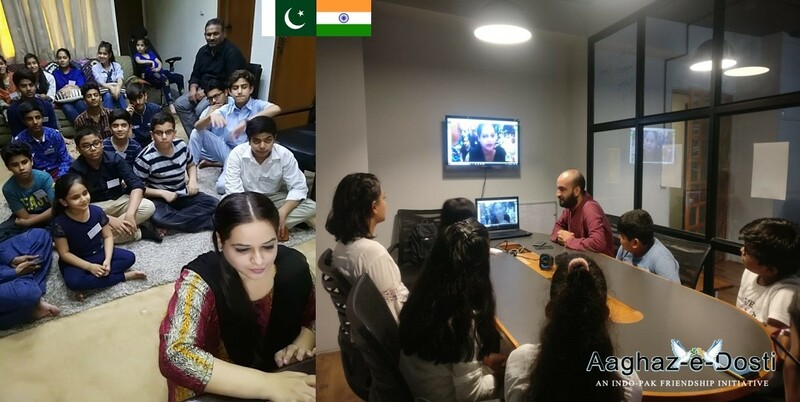 Pakistanis and Indians got a chance to come together virtually as the Aaghaz-e-Dosti organised the 2nd virtual cross-border open mic with Aaghaz-e-dosti Surat, Gujrat team and Aaghaz-e-dosti team Lahore. Open mic was held at Lowkey Lokai, a space that brings together people & community to dialogue and debate issues that are critical for building a peaceful society. 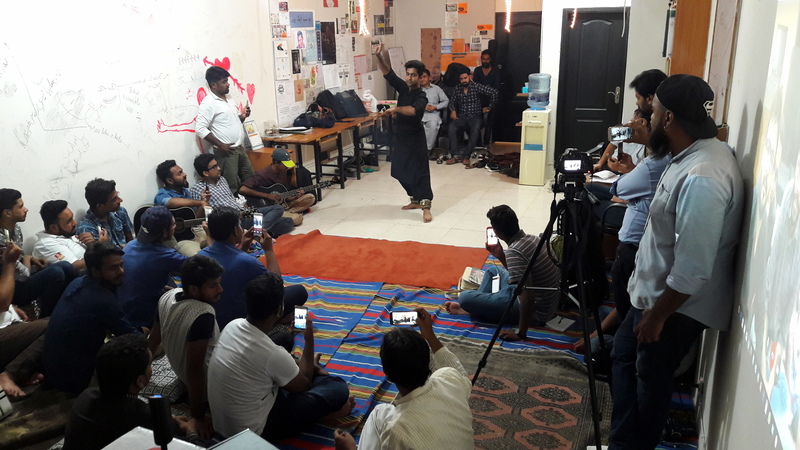 The basic objective of the open mic was an interactive session among Pakistanis and Indians through which art, music and culture could be promoted. Both sides have a notion about the people of other side as strangers and others. Aaghaz-e-dosti has an aim to abolish this ‘otherness’. Kevin West and Ahsan Aslam from Qaid the band of Lahore initiated the event by singing an Indian song Qurban Hua and Saiyyoun Nee by Junoon Band. Qaid band had outstanding vocals and voice. The event got pace with a dance performance by Hammad rasheeed, a choreographer and a Kathak dancer also teach at LGS. Hammad has performed more than 100 times in India and Pakistan during the span of last 3 years. He has also choreographed for Pakistan Television, Ajoka Theatre and many other organizations. Hammad did Kathak dance on Raag Bhagraiwaan and Khamaj by Shafqat Ali. This performance fascinated the setting. As event got rhythm, performances from both the sides were presented turn-by-turn. Mark Xavier, engineering student sang sufi song. Following the Sufi music Joshua Dilawar, a social activist and student of journalism sang Gulabi Ankhain and Taaray Zameen Per. Mohsin, a student of Gender Studies Department, Punjab University did mimickery and both sides were echoing with laughers. 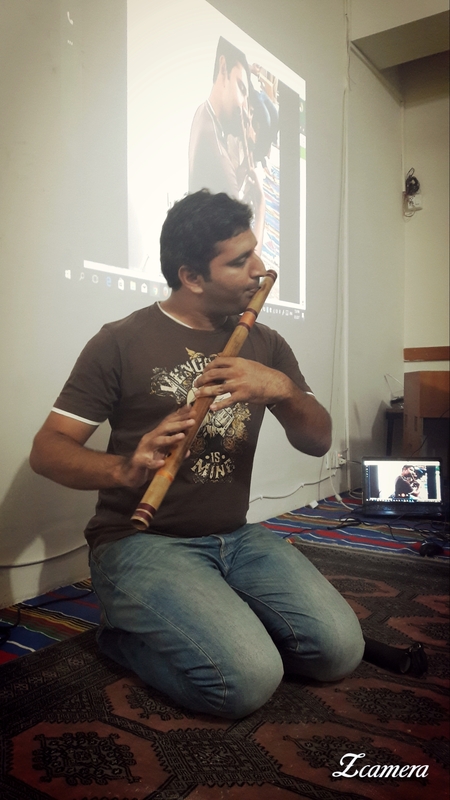 Saddam Hussain from Lahore came up with amazing flute and caught everyone’s attention. Mobeen Ahmad, student of Philosophy from Lahore was another person with flute gave his best. Zeeshan Sarwar, ended the show by singing a song of peace. Fayyaz, a chemical engineer and member of Aaghaz-e-dosti delivered a poem of his own demanding for peace, humanity and harmony. Participants appreciated the campaign and this Open Mic event. They were very keen to be invited in such upcoming events of Aaghaz-e-Dosti to promote Peace and tolerance. Participants emphasize that both Governments should replace this conflict and tussle with Peace and harmony. Visa process should be easier, so that people may visit across the border easily one of the participants said that. The Aaghaz-e-Dosti, a joint initiative of Mission Bhartiyam (India) and Hum Sab Aik Hain (Pakistan), aims to eradicate mutual hatred and suspicion to create unwavering bonds of peace and friendship. They believe that miscommunication and lack of communication has helped sustain the conflict. To meet objective, the Aaghaz-e-Dosti has taken several initiatives ranging from interactive sessions in schools to public demonstrations, from art-based initiatives to writing articles and issuing statements to disseminate the misrepresented voice across the border. Hum Sab Aik Hain represents Aaghaz-e-Dosti Pakistan; an organization formed by a group of young people based in Lahore. The objective of this organization is to promote peace and harmony among the masses by highlighting, advocating and organizing towards discourses and movements to bring about socio-political and the economic changes required for a peaceful society. Aaghaz-e-Dosti Lahore chapter organized ‘Chiraagh-e-Aman Jalao’ on 6th August 2017. Aaghaz-e-dosti believes in peace and harmony in South Asian Region and the whole world, collectively. Mainly there are two reasons why Chiraagh-e-aman Jalao was organized. Firstly, in August 2017, Pakistan and India are going to be 70 years old and still the two neighboring countries are living in conflict. Even after 70 years of birth, Pakistan and India needs to resolve all the contemporary conflicts including border conflict. We are gathering at river Ravi, which symbolize that future of India and Pakistan must flow together like waves of river and with the virtue to serve humanity. We gathered on 6th August as 6th and 9th August 1945 has been one of the darkest days in world’s history when during the final stage of World War II, the United States dropped nuclear weapons on the Japanese cities of Hiroshima and Nagasaki. The two bombings, which killed at least 129,000 people, remain the only use of nuclear weapons for warfare in history. We hope that despite being nuclear empowered nations, India and Pakistan will take all steps to resolve their conflicts and to provide future generation a better region that will be free from any kind of violence, hatred, conflict and war. Our future must grow together. This, Chiraagh-e-Aman was a very tiny memorial for all violence and hatred provoking incidents resulting in numerous victims. Aaghaz-e-dosti calls on all actors to regurgitate the significant responsibility of the States in the prevention and resolution of conflicts. AED also stresses the importance of peace and humanity. AED urges all actors to increase their inputs for sustaining peace. Aaghaz-e-dosti demands both Pakistani and Indian State to back the treaty banning nuclear weapons. It’s been more than seven decades when the world has witnessed the macro destruction due to nuclear weapons, now it is the time to learn from the her-story. Both nations need and dreams for the freedom from poverty. We demand for a welfare state instead of a security state. People are still deprived from pure drinking water, health facilities, food, shelter etc. Both countries need to relax visa policy and increase trade, religious tourism, cultural exchange etc. For emphasizing on this AED called the both nations to join to lit the lamp, a lamp of hope, harmony and humanity. Aaghaz-e-Dosti (lit. beginning of Friendship) aims to eradicate mutual hatred and suspicion to create unwavering bonds of peace and friendship. This is because we believe that miscommunication and lack of communication has helped sustain the conflict. To meet our objective, Aaghaz-e-Dosti has taken several initiatives ranging from interactive sessions in schools to public demonstrations, from art-based initiatives to writing articles and issuing statements to disseminate the misrepresented voice across the border. Aaghaz-e-Dosti seeks to enhance people-to-people relations. It seeks to become the medium to discover and recognize the misrepresented reality on the other side of the border. Aaghaz-e-Dosti was started in 2012 by Mission Bhartiyam, an India-based youth organisation. It has collaborated with several organisations in the past but from May 2017, Aaghaz-e-Dosti became a joint initiative of Mission Bhartiyam and Pakistan-based “Hum Sab Aik Hain”. ‘Hum Sab Aik Hain’ is an organization formed by a group of young people based in Lahore. The objective of this organization is to promote peace and harmony among the masses by highlighting, advocating and organizing towards discourses and movements to bring about Socio-Political and Economic changes required for a peaceful society. 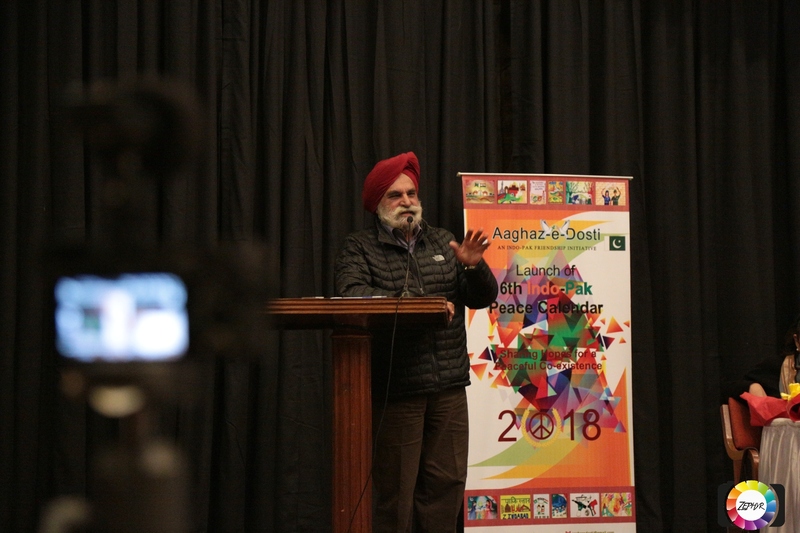 Pakistanis and Indians got a chance to come together virtually as the Aaghaz-e-Dosti organised the first virtual cross-border open mic with Vijay Kumar and friends of Ideal Youth Health & Welfare Society of Delhi. Sadaam Hussain and Umair Ali played flute, Zeeshan Sarwar, Allen Earl-West and Haroon Hashmi sung as well. Session ended with the sufi performance the Qade Band. 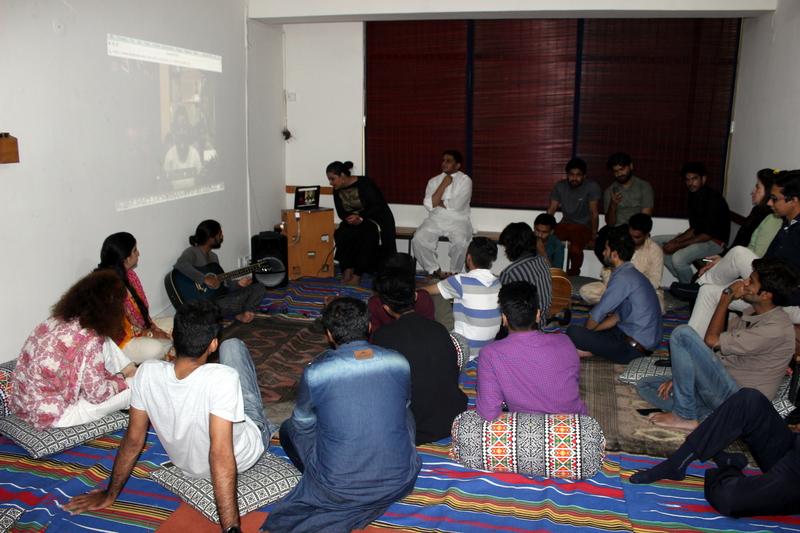 Youth from both the sides participated in open mic virtual event through internet video call from Delhi and Lahore. 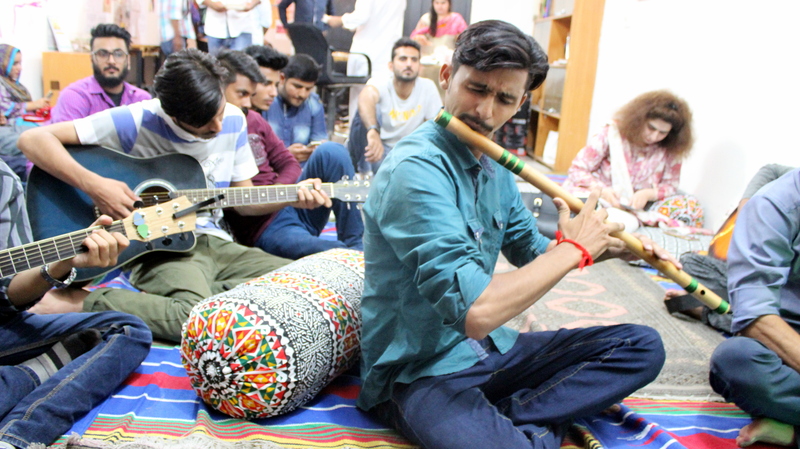 The basic objective of the open mic was an interactive session among Pakistanis and Indians through which art, music and culture could be promoted. Saad Hafeez and Hassan from Qade Band of Lahore initiated the event by singing an Indian song Teri Deewani with outstanding vocals and voice. The event got pace with another song Allah hi dyga, Mola hi dyga. 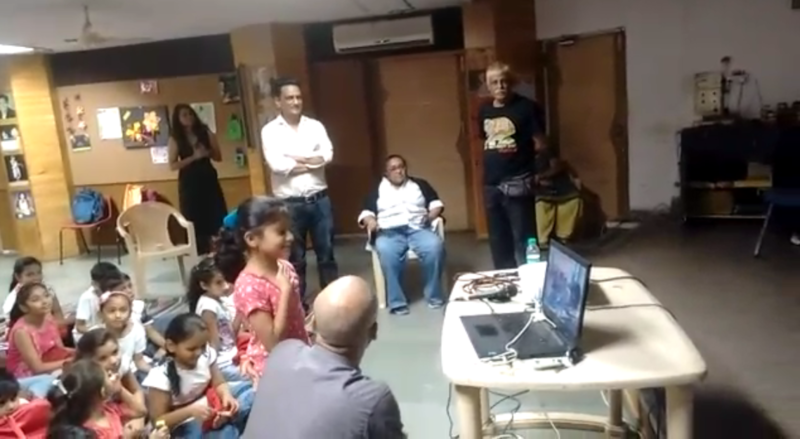 While Vijay Kumar from Delhi side along with children sang a folk song in Bohjpuri language. As event got rhythm, performances from both the sides were presented turn by turn. Kevin and Sam from Lahore gave instrumental piece Anokha Laadla, John from Delhi sang Tu na jany aas pas hy khuda. Saddam Hussain from Lahore came up with amazing flute and played marr jaon ya ji lon zaraa and Lambi judai. Vijay Kumar did a special group performance with drum. Allen with classical singing training made another contribution in event with classical songs. Umair Ali from Lahore was another person with flute gave his best. From Delhi, it was requested to sing a classical song of Ghulam Ali, and Allen make a stunning performance with Chupky chupky raat din. Nazr mein rhety ho jb tum nazr nahen aty, a famous song was sung by Zeeshan Sarwar from Lahore. Neha, a 12 years old girl from Delhi asked from Lahore team Do Muslims in Pakistan go to Mandirs as Hindus visits Dargah and Mosques. People from Pak side responded, Yes, we have two famous Mmandirs in Lahore and we do visit, moreover we celebrated HOLI with our Hindu friends and community this year. Neha was asked by Lahore team that when will she visit Lahore She replied When You people will send me visa. Lahore team asked from children of Delhi about their favourite Singer from Pakistan. They replied, Atif Aslam and Rahat Fateh Ali Khan. During the event signature campaign for Peace Now and Forever was also in process. Participants appreciated the campaign and this Open Mic event. They were very keen to be invited in such upcoming events of Aaghaz-e-Dosti to promote Peace and tolerance. Participants said that emphasize that both Govt should replace this conflict and tussle with Peace and harmony. Visa process should be easier , so that people may visit across the border easily one of the participants said that. At the end a poem Ao mil kr hum sb sath chlen was presented by Fayyaz from Lahore. After that Delhi Team gave their last group performance. Give me sun shine and Saad Hafeez from Lahore concluded this event with his mind blowing performance which made every body mesmerized. Tery Ishq mein jo bhi doob gaya and ‘Laal meri Ptt rakhiyou bhla. This is how a beautiful evening ended, Participants said Good bye to each other till next virtual or real meeting. Aaghaz-e-Dosti Pakistan is represented by Hum Sab Aik Hain is an organisation formed by a group of young people based in Lahore. 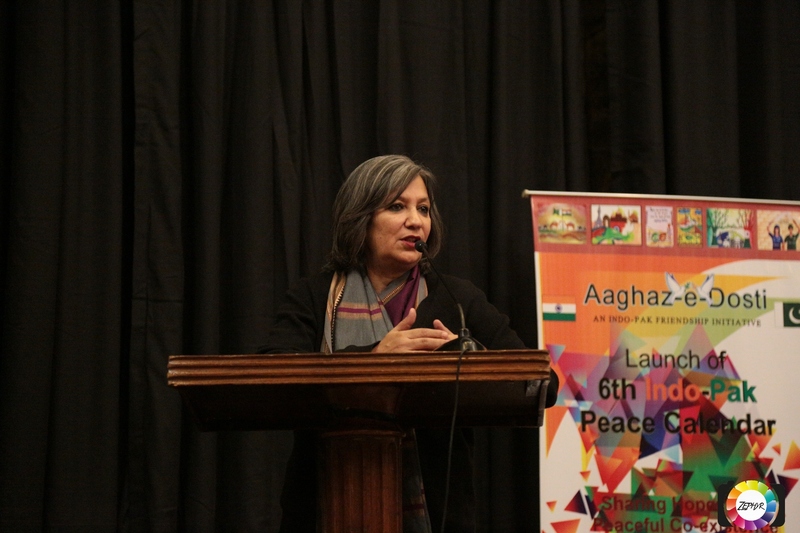 The objective of this organisation is to promote peace and harmony among the masses by highlighting, advocating and organising towards discourses and movements to bring about socio-political and the economic changes required for a peaceful society. Based in Delhi, Ideal Youth Health & Welfare Society founder Vijay Kumar is a certified trainer of Play for Peace and he works with the marginalised youths including Dalits and school dropouts. The Ideal Youth Health & Welfare Society is a civil rights based organisation, working with marginalised community children and young adults in Delhi. With the objective to increase the peace tribe, Aaghaz-e-Dosti launches peace internships. The Peace Internship Program is a four-week internship program (can be extended) which while being specialized in a specific field – writing, research, video editing and designing, will inculcate an understanding of peace and conflict in context of the Indo-Pak issue. The internship will equip you to understand conflict, and contribute to peace between India and Pakistan. The Peace Internship Program has been designed keeping in mind the voluntary nature and the time constraints that may bound an individual. The program is home-based and easily doable but does require hardwork. An intern will have to devote about 10 hours in a week. Since this is a non-funded initiative, we will not be able to offer any monetary remuneration. However, the interns will receive a certificate on the completion of the internship program. Aaghaz-e-Dosti is offering four types of internship. While an applicant can apply for more than one, he/she will be accepted only for one. Writing Interns will be given a maximum of 4 different writing assignments which may include movie review, article, poem and fiction story. Feedback will be provided on the writing style, analysis and understanding of the conflict. To apply, please send a writing sample along with your CV and statement of interest. Work: This will be done in a group. A group of 4 people will work on a particular issue that informs the Indo-Pak Conflict. The team will divide the work and will be involved in compiling, analyzing and documenting data. The objective of the research team will be to understand the issue from different perspectives. Data collection will involve finding and reading existing works, collecting data through survey and interview method. The team will write a joint report. Besides the report, they can also explore creative, alternative methods to present the findings. Eligibility: Any previous experience in research will be preferred. To apply, please send your CV and statement of interest. Interns will make video on particular issue, in collaboration with research team or independent. This will involve video making and editing work. Eligibility: Some experience in video making/editing is mandatory. Please share any previous work along with your CV and statement of interest. Design Interns – photo editing and designing of posters (content will be given). Eligibility: Some experience in designing and photo editing is mandatory. Please share any previous work along with your CV and statement of interest. The first peace internship will start from 20th June (tentative date). Please do not apply if you will not be able to commit one month (10 hours a week) for this program. Aaghaz-e-Dosti, a citizen diplomacy group, conducts peace education activities in schools and colleges in India and Pakistan. Among these peace education activities is the Indo-Pak Classroom Connect program which connects two classrooms through video conferencing and initiates an informal dialogue between the students. The session facilitates them to know each other, explore the everyday life, culture and to bond over the similarities and learn from the uniqueness. This session helps to dispel the popular stereotypes that restricts people to people contact and peacebuilding. Indo-Pak classroom connect sessions have witnessed students bonding over similar food culture, singing songs together, reciting peace poems, celebrating birthday of a student by cutting a cake on both sides and the 9th Indo-Pak Classroom connect added another gem to this program. 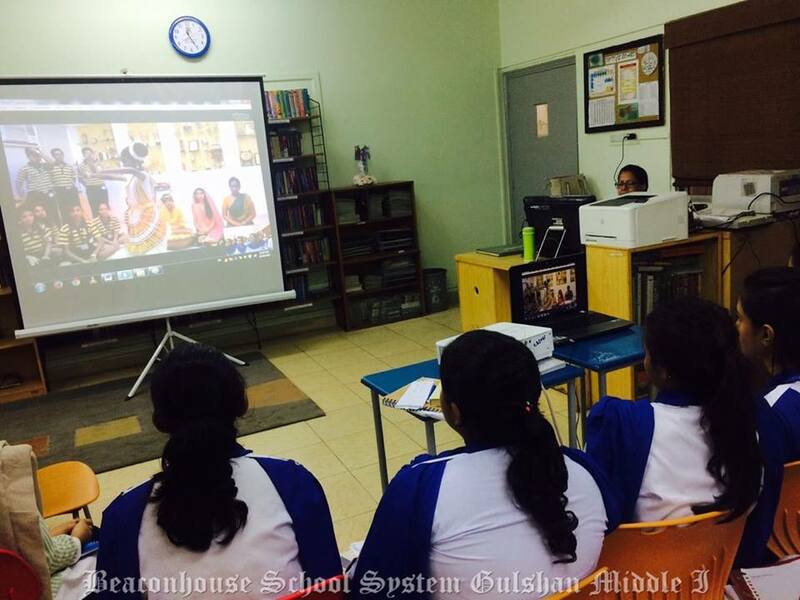 In the 9th Indo-Pak Classroom connect that had connected students of Gujarat Public School (Vadodara, Gujarat, India) and SMB Fatima Jinnah Government Girls’ School (Karachi, Pakistan), students did dance performances for each other. The Karachi students showcased a Sindhi dance form and also danced on a popular folk song “Lathe ki Chadar”. The Gujarati students from India did a garba.